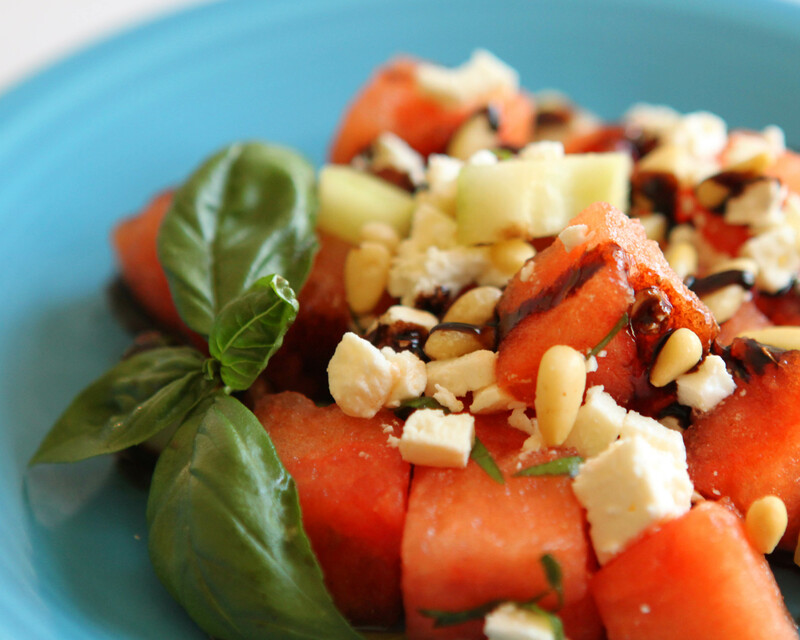 This Watermelon Salad with Cucumber and Feta is very flavorful and refreshing. Watermelon is a fantastic source of Vitamin C and lycopene, a powerful antioxidant that makes watermelons and tomatoes red; and may prevent prostate cancer. The monounsaturated fat from the extra virgin olive oil and pine nuts will help your body absorb the fat-soluble vitamins, A, E and K. Plus, monounsaturated fat will increase your HDL, the good cholesterol, and decrease your LDL. For a sweet and juicy watermelon, pick one that is heavy for its size and has a creamy white to yellow patch. This means it wasn’t picked too early and allowed to ripen on the ground. My sister-in-law swears that the small seedless watermelons with very dark green lines are the best. Lastly, you can find reasonably priced reduced balsamic vinegar and pine nuts at Trader Joe’s. Try this salad with marinated grilled chicken or shrimp. In a small mixing bowl, whisk together the dressing ingredients and set aside. In a large mixing bowl, combine the watermelon, cucumber, pine nuts and basil. Toss gently with the dressing. Sprinkle with feta cheese and garnish with the reduced balsamic vinegar. Nutritional information*: Calories 113.5, Total Fat 8.0 g, Saturated Fat 1.6 g, Cholesterol 56 mg, Sodium 99 mg, Potassium 224.6 mg, Total Carbohydrates 9.6 g, Fiber 1.1 g, Protein 2.6 g.
Note: These calculations were made with full fat feta cheese.